All it takes to outfit your ecommerce site with effective upsell and cross-sell offers is a thorough understanding of your customers’ needs combined with the ability to offer the upsell at the right time using automation. Almost every online shopper has experienced Amazon’s mastery of the upsell. With their endless product suggestions, “Frequently Bought Together” prompts, and bundled packages, it’s no surprise that upselling accounts for over 35% of its total revenue. Upselling doesn’t have to be reserved for huge companies with hundreds of thousands of products to push at their customers. In fact, you get upsold (or cross-sold) every time you say yes to the smiling waiter who offers you dessert at the end of your meal or to the phone company who convinces you to add additional data to your monthly plan. Upselling is about understanding and anticipating exactly what your customers will want and offering it to them at just the right moment. Selling more products to existing customers is often overlooked in favor of seeking sales from new leads, but that’s a mistake. On average, the probability of successfully selling to a new lead is 5-20%; that number triples when selling to existing customers. These revenue-generating sales boost your ROI, increase the value of each customer, and usher your customers into becoming advocates of your company who refer new customers. All it takes to outfit your ecommerce site with effective upsell and cross-sell offers is a thorough understanding of your customers’ needs combined with the ability to offer the upsell at the right time using automation software. Your relationship with your customers shouldn’t end the moment they click “BUY.” You should look at this as the start of your relationship with them — as ongoing relationships have been shown to be much more valuable. So how can you identity effective products to sell to existing customers? It’s simpler than it sounds: Find the product orbit. The what? Keith Perhac, the co-founder of Summit Evergreen, defines the product orbit as “a sales strategy in which your product offerings naturally lead into one another,” essentially leveraging the natural synergy between two products to move an existing customer from one product to another. Ask yourself what would be in the orbit of each product so you can map out the customer path to provide more value to your customer while making more money. For example, if you were offering online beginner French classes, items in the product orbit might include a French grammar workbook or an advanced version of French classes for those who have graduated from your first class. What products would your customers naturally gravitate toward once they’ve already expressed interest in one product? 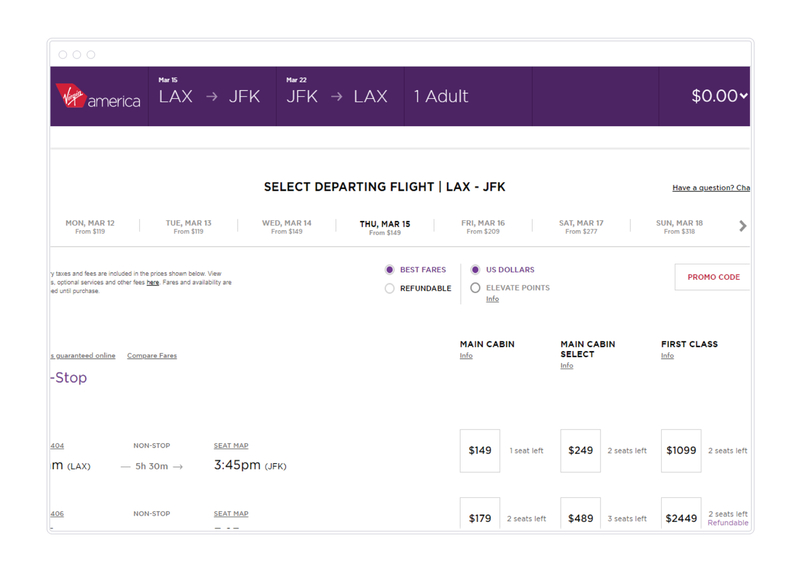 Consider this example from Virgin America. With the basic flight itself as the base offer, they then leveraged seats with more legroom and better amenities. Customers can choose to make their flight more comfortable or luxurious, depending on how much they’re willing to spend. There are many different ways to use a product’s orbit to your advantage. The most popular, as outlined in the example above, is the upsell. By definition, an upsell is a strategy or technique in which a company promotes a more expensive product, upgrade, or add-on in an attempt to prompt the customer to make a more profitable purchase. 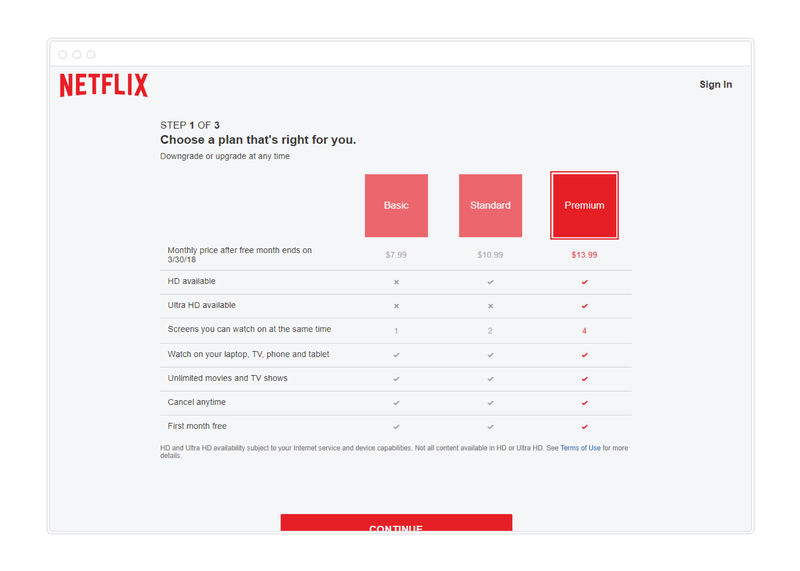 Netflix does an excellent job of upselling its subscription-based video streaming services, as they offer a $7.99, $10.99, and $13.99 option. The features offered in the Basic account look rather bare in comparison to the Premium account. The prices of the service also contribute to the allure of the upsell, as they are all within a decent range of each other. A price increase of $3 is by no means a big leap. In addition to upselling, there’s cross-selling, which involves recommending relevant products or services in addition to the one that’s already in their shopping cart. While upselling is offering a pricier version, cross-selling is offering an item that would complement the product or service being purchased. For example, a wine retailer could upsell by suggesting an older, pricier wine or make a cross-sell by suggesting purchasing a wine opener as well. You might also be familiar with Amazon’s classic bundle strategy, also known as their “Frequently bought together” section where the products recommended are intuitively related to the original product. Using their customer data to discover what a customer generally buys after purchasing the original product, Amazon then offers relevant suggestions to create a bundle. This benefits the customer in two ways: by exposing customers to products they might be aware that they need and by saving them time from research. 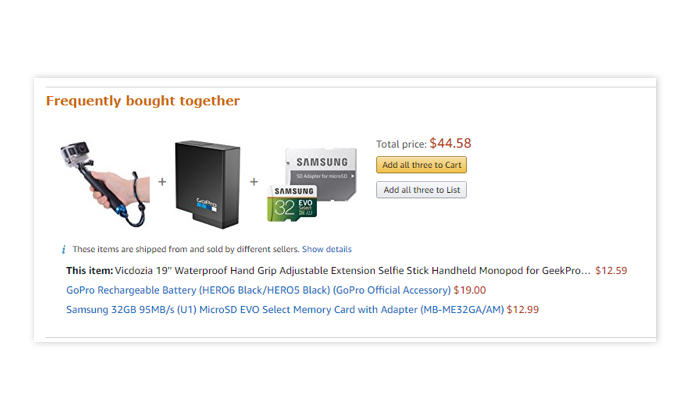 If those items are frequently bought together, then the customer can safely assume that the memory card and rechargeable battery will work with their GoPro. It’s not just one product recommendation — but rather two or three options that work well with the product. This creates an easy and time saving buying decision for the customer. Alternatively, there’s the downsell. If a customer does not want the product you want to sell, you suggest a cheaper alternative. In an upsell, you would market a product that costs more than the original purchase; for the downsell, you would promote something less expensive than the original. Think of the last time you were at a car dealership. The car salesman might have presented the luxury car first. If you hesitated, he showed you the economy car. This also works for subscription-based services. It’s a great way to capture a sale for customers who aren’t quite ready to buy the full price option or commit to an extended period of time. 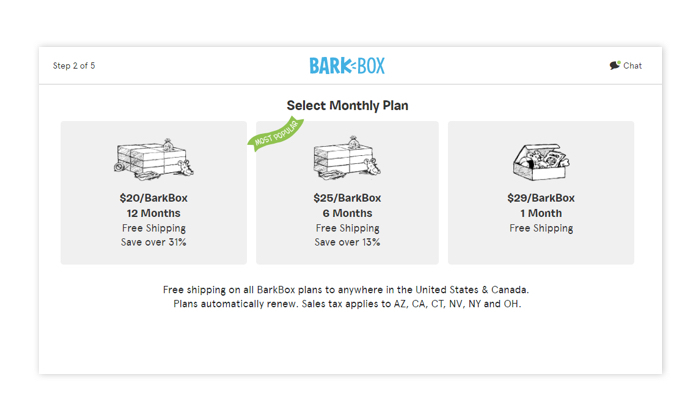 Check out how BarkBox gives consumers the option of choosing a cheaper subscription depending on their commitment level. They also display the “Most Popular” option so visitors can quickly see what’s the most common choice. With your customers’ needs in mind, use these three guidelines to ensure you provide your customers with another appealing product or service so you can make an effective sell. A great upsell/cross-sell product pairs well with or supplements a customer’s initial purchase. Let’s say your company sells bottled wine; an obvious auxiliary product would be something to drink the wine out of, such as wine glasses. Additional examples would be: a zoom lens if you’re selling cameras, technical support sessions if you’re promoting software, or a warranty if you’re selling hardware. Relevancy in your post-purchase offer allows the customer to get the most out of your product. Effective upsells highlight the benefits of the additional product, rather than showcasing the features. Whereas a feature is merely a tangible component of your product or service, a benefit paints a picture of a better life. Connect your upsell to a very specific feature of the original product and extrapolate how it will enhance the overall benefit of the product. If your company sells electric lawnmowers, an intuitive upsell would be an extra battery pack with five additional hours of power allowing you to mow your entire lawn without running out of juice. As a rule of thumb, your upsell should not cost any more than 25% more than the original product and a cross-sell product should be approximately 60% cheaper than the original. These closely related prices will help the customer make a snap decision, rather than lamenting over cost. Nasty Gal includes an enticing upsell on its order page, offering free shipping for adding an additional $7 to the shopping cart, a fraction of the intended purchase price of $68.00. When it comes to shopping online, timing is everything. When will the customer be more likely to commit? Are they impulsive buyers or do they need time to settle into the idea of purchasing more from you? It’s crucial to understand your audience before you make this decision. Build detailed customer profiles at every stage of the buyer journey, including their roles in the organization, goals, needs and pain points. If your target audience is more likely to make quicker purchasing decisions, one-click upsells are the way to go. One-click upsells involve making an offer immediately after your customer’s purchase that can be purchased with one click. Once customers have entered their credit card and their information is cached, it’s very easy and quick to click “yes” on an upsell. 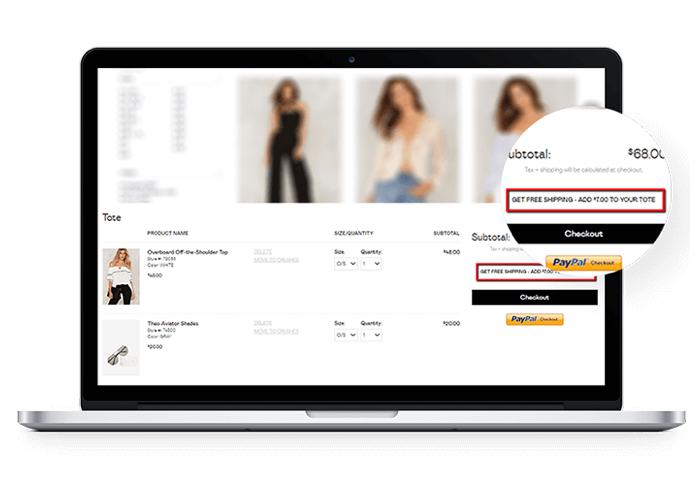 By creating an upsell form or page that pops up immediately after the purchase, your customers can take advantage of your offer without having to re-enter their purchase information. The less effort the upsell takes on their part, the more likely the customer will participate. Some customers prefer to sleep on their decisions, in which case, the aftersell is ideal. An aftersell occurs over a longer time frame, after the customers have had time to realize the value of their initial purchase. For example, if the customer purchased a bottle of wine from the retailer, the wine retailer could reach out after a month or so (assuming the customer has already enjoyed the first bottle) and suggest purchasing a new type of wine. To really increase your chances of generating more revenue with these offers, feel free to implement both one-click upsells and an aftersell. The bottom line — keep the relationship going by offering your current customers relevant, appealing products or services. Follow up with all the new customers you have acquired to ensure they are happy with their product or service and offer them a chance to continue this journey. Continually delighting customers with relevant, appealing offers will result in happier, lifelong customers and more revenue for your online business. When implementing upsells and cross-sells into your buying process, be sure you’re not overdoing it. Flashing too many options in front of a committed prospect who is ready to purchase can be a recipe for disaster. You already have the customers’ intent to purchase your product, so don’t deter the purchase by forcing them into a high-stress decision which may cause them to reconsider their original decision. Campaign Strategist Tatiana Doscher is a graduate of the University of California, Santa Barbara with a dual B.A. in Communication and Global Studies. After working with several small and local businesses, Tatiana joined ONTRAPORT’s Marketing team. She loves running, hiking and enjoying Santa Barbara’s beautiful beaches.